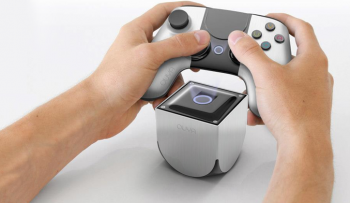 High demand, according to Ouya CEO Julie Uhrman, is the reason for the launch date slip. Ouya's launch date has slipped back from the 4th to the 25th June, and increased demand is to blame, according to Ouya CEO Julie Uhrman. "Incredibly positive reactions from our retail partners," says Uhrman, persuaded the Ouya team that, if it was to have any hope of putting the required number of units on store shelves, it needed to push the launch date back by three weeks. But that's just about the last hurdle Ouya needs to leap. Rumored issues with the controller have been resolved; a problem where buttons could become stuck beneath Ouya's removable faceplate was a simple fix, as all the team needed to do was widen the faceplate's button holes. "I don't know what the exact millimeter is," says Uhrman, "but we've increased the size just a little bit." The new controllers will ship with the Ouya in June. The one hundred dollar Android console has had its problems, but excess demand is a good problem for a manufacturer to have. Now we just have to find out whether its 10,000-odd game developers can put out some interesting product.